The Perilous Politics Of The Health Insurance Tax Break : Shots - Health News Economists say that excluding the value of employer-sponsored health insurance from federal taxes makes no sense. But many worry that changing the tax code could mean higher taxes or that employers would push down the value of the health insurance they provide. 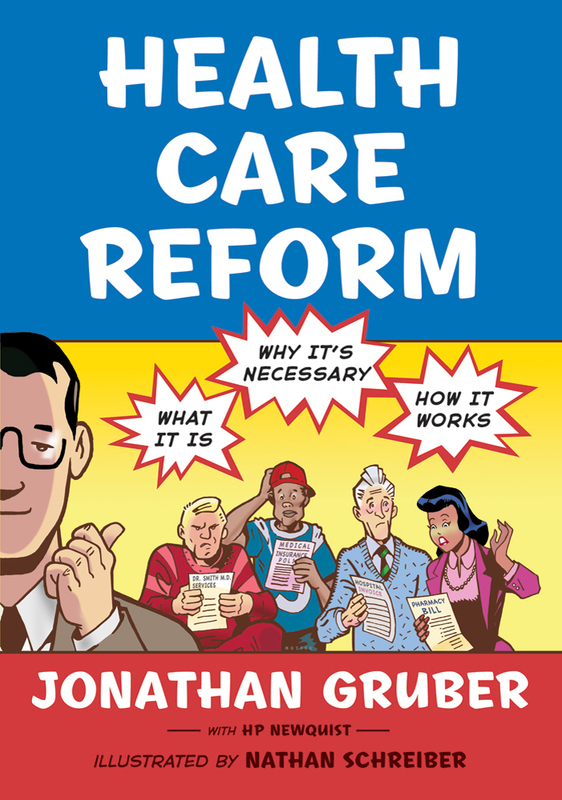 MIT health economist Jonathan Gruber, who explained the ins and outs of health overhaul in a comic book, says that excluding the value of health insurance from federal taxes is a terrible idea, at least from an economist's point of view. There's not much in health care that economists agree on. But one of the few things that bring them together is the idea that excluding the value of health insurance from federal taxes is nuts. "It just doesn't make sense," says Jonathan Gruber, an MIT health economist and author of Health Care Reform. "And it's important to emphasize in this world where economists seem to agree about nothing, this is something where there's just broad and universal agreement." There are several reasons for that. One is that it's expensive — it costs the federal government nearly $250 billion a year. Another is that it's regressive — it benefits people with higher incomes more than those who earn less. And finally, the tax benefit encourages people to take their compensation in health insurance rather than wages. That, in turn, encourages them to use more and more health care. "Here's another way to think about it," says Gruber, who has written at length on the subject. "We have a system where we bribe you to get employer-sponsored insurance. And the richer you are, the bigger bribe you get." So if everyone agrees it's such a wrong-headed policy, why is it still around? Mostly, it's inertia. "It's very hard to get rid of [the policy]. It's very hard because people view it as a tax increase," Gruber says. "And as hard as economists try to explain that, no, it's just ending a tax subsidy ... people just say 'don't increase the taxes on my health insurance.' "
Organized labor has led the defense. Unions have spent years negotiating for better benefits rather than higher wages. AT&T call center worker Valeria Castle-Stanley came to Washington from southwest Virginia back in 2009 to protest the idea of taxing the most generous health plans to help pay for the federal health law. "We're not rich," she said at a demonstration outside the Capitol on that cold December day. "We're average middle-class Americans. We need quality health care. When I heard some of our senators want to tax our health care, I just couldn't believe it." The health law in the end did include the so-called Cadillac health plan tax, although it doesn't take effect until 2018. But labor officials warn it's not just union members who will be affected when that tax kicks in. Same goes if Congress decides to expand the taxation of employer-provided health insurance. What's likely to happen to most workers is that "employers will push down the value of their coverage, and their insurance plans will simply cover less," says Tom Leibfried, a lobbyist for the AFL-CIO. "So their deductibles will be higher. Their copays with each visit will be higher. Many of the approaches to putting a limit on this tax exclusion are designed to do just that — increase cost sharing for consumers." Leibfried says that taxing health benefits is based on the idea that "working families are overinsured and use too many services. But I have yet to meet anyone who comes forward to say they feel like they're overinsured." Unions aren't the only ones resistant to changing the tax treatment of health insurance, however. "We're very concerned at this pivotal, transitional moment in the nation's health care system about any change in tax treatment that would upset the apple cart in terms of what is so important for employees' financial protection," says Jim Klein. He's president of the American Benefits Council, which represents large employers who offer health insurance to their workers. Klein also insists it's backward to say that the tax exclusion benefits the wealthier more. "For whom would it be more difficult to obtain coverage if not from their employer — Warren Buffett or his secretary?" he says. "The benefit is very progressive. It means much more to a lower-paid person than a higher-wage individual." It's been that combination of opposition from both employers and workers that has made the tax treatment of health insurance sacrosanct for so long. But Ron Pollack, of the consumer group Families USA, says he wouldn't be shocked to see a bigger effort to tax health benefits if — and it's a big if — it was in exchange for sparing Medicare and Medicaid from larger cuts. "If there's a modification in the tax exclusion, if that's used as a way to allow tax rates to go down ... I just don't think that makes sense at all," Pollack says. "If, on the other hand, it's used to minimize any potential cuts to Medicaid and Medicare, then I think we've got something that's sensible. Because you're protecting programs for people that desperately need them. And if you're doing it carefully, you're finding an alternative that really affects people at the highest income levels and people who have really good health coverage." Whether Congress and the president will take that advice, however, remains the $250 billion question.